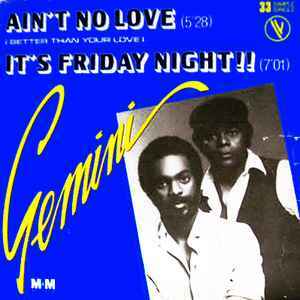 Gemini (19) ‎– Ain't No Love (Better Than Your Love) / It's Friday Night!! Produced For – Git Down Brown Productions, Inc.
Phonographic Copyright (p) – M&M Records, Inc. Copyright (c) – M&M Records, Inc.
℗ © 1981 M & M Records, Inc.
same version of the lp rising !